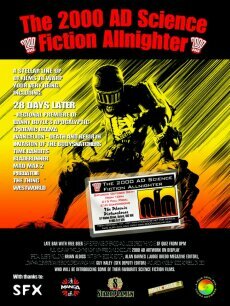 It's a well known fact that 2000 AD readers are partial to the odd sci-fi flick, and even the really odd sci-fi flick, so with this in mind, the Galaxy's Greatest Comic has linked up with the Phoenix Cinema in Oxford to offer 2000 AD readers and sci-fi film buffs the chance to spend the entire night from 10pm on Saturday 26 October watching some of the best science fiction ever committed to celluloid. Apart from a host of science fiction classics, the event will also include film introductions from 2000 AD editors and other industry luminaries, free beer and chocolate, a movie quiz plus plenty more. The event kicks off with the local premiere of Danny Boyle's latest film, the apocalyptic 28 Days Later, which is a chilling depiction of London in the aftermath of a devastating viral outbreak. Clearly influenced by some of the all time classics of dark British science fiction film and television, such as Quatermass, Threads and Doomwatch, 28 Days Later combines suspense with terror in a frighteningly plausible visualisation of a familiar city laid waste. From this point the pace never lets up, with a selection of films that represent everything that's great about movie science fiction. Blade Runner, depicting one of the most visually stunning future cities seen this side of the pages of Judge Dredd is joined on the bill by the Cursed Earth-like post-apocalypse classic Mad Max 2. Paranoid sci-fi horror comes doesn't come any better than the original Invasion of the Bodysnatchers, though if there ever was a movie to rival it, then John Carpenter's visceral shocker The Thing would be the one. The replicant Leon says in Blade Runner, "Painful to live in fear, isn't it? ", and the casts of two more of the night's movies would be happy to confirm that, as Arnie's elite special forces unit is hunted down by the deadly Predator, and Yul Brynner's merciless android cowboy stalks the visitors to the Westworld theme park. For sheer originality, incredible visuals and twisted humour, it would be very difficult to find a better film than Terry Gilliam's Time Bandits, in which a young boy joins a band of time-travelling dwarves who have stolen a map of the universe's time holes. The film features a cast of legendary British actors, including David Rappaport, Sean Connery and Ralph Richardson, and is also one of 2000 AD editorial droid Cyber-Matt's favourite films. Matt says,"Terry Gilliam's most coherent and satisfying film alongside 'Brazil', this is outstandingly inventive and brilliantly acted by a cast of fantastic British character actors. David Warner as Evil? Ralph Richardson as the Creator? Ian Holm as Napoleon? John Cleese as Robin Hood? Bring it on! With scenes every kid loves to see in any movie (giants, monsters, tanks coming through walls) and enough knowing wit and darkness to appeal to adults, this is imaginative cinema at its best." And for those people who like a bit of animated giant robot action, we will be showing Manga films' latest release, Evangelion: Death & Rebirth, one of the most well regarded films in the illustrious history of anime carnage. But that's not all, for the televisions in the bar will be showing episodes of the sci-fi savvy Channel 4 comedy series Spaced, and the 1995 Judge Dredd movie, starring Sylvester Stallone. Special guests including Brian Aldiss, Matt Smith (2000 AD Editor), Alan Barnes (Judge Dredd Megazine Editor, Jonathan Clements (Anime Encyclopedia/Big Finish), Guy Haley (SFX Deputy Editor), and Jason Kingsley (2000 AD/Rebellion CEO), who will be introducing some of their favourite science fiction films.